How is Muscle Size calculated? MuscleSound determines the size of a muscle by measuring its thickness at predetermined locations. However, the fluid content of a muscle increases both during and following exercise. This will transiently increase the muscle volume and resulting in an erroneous assessment of its actual size. During exercise, blood and associated fluids shift into the muscle to meet the increased metabolic demand (Andersen & Saltin), a condition known as "Exercise-induced hyperemia” (Wray et al., 2005). This process, also referred to as “Transient Hypertrophy”, increases the size of the muscle, both during, and for a variable period of time after exercise. While the magnitude and extent of this well-established phenomenon are generally dependent on the mode, duration and intensity of the exercise session, there are wide individual variations in responses (Garton et al, 2014). Over the last several decades, strength Increases occurring early in a training program were thought to be caused by neural adaptations in the muscle over a period of between 6-12 weeks. An increase in muscle size (Hypertrophy) was considered to be a relatively slow process, beginning only after these neural adaptations were completed (Moritani & Devries, 1979; Sale, 1988). However, recent studies using ultrasound have shown that hypertrophy can occur within the first 2-3 weeks of training. (Loenneke, et al., 2017; Seynnes, et al., 2007; Ogasawara et al., 2012; Krentz & Farthing, 2012). The magnitude of such changes and the capacity of ultrasound to detect them will vary according to the mode, intensity, and duration of exercise. Research has shown that ultrasound is capable of detecting changes in Muscle Size over this time frame, depending on the mode of exercise, and assuming it is of sufficient duration and intensity. What Muscles can be Assessed? How well does MuscleSound Measure Muscle Size? Ultrasound provides a direct measurement of muscle thickness. This produces valid and reliable results (Tillquist, et al., 2014, Sanada, et al., 2006), as long as “Standard Procedures” are followed. For consistent results, the assessment must be taken pre-exercise when the client is fully rested and recovered. THIS IS CRUCIAL! The scanned thickness of a muscle can transiently (and variably) increase both during and post exercise. After High Intensity exercise, scanned muscle size can increase by as much as 25% compared to pre-exercise levels. Probe is located at predetermined positions on the muscle. For example the midpoint of RF is standardized based on the height of the person being scanned. Changing the location of probe by as little as +/- 1 inch can result in a muscle size change of up to +/- 12%. Individual must be lying down relaxed on a flat and even surface (use a training table, or yoga mat). Sitting up can result in a muscle size change of up to +/- 9% between these two body positions. Uneven surface such as lying across a few chairs can result in a muscle size change of up to +/-8%. NOTE: "Resting" the probe on the muscle is “Standard Protocol”. Pressing the probe into the muscle will compress the tissues, resulting in an underestimation of muscle size. Lifting the probe from the muscle tissues will allow them to expand, resulting in an over estimation of muscle size. NOTE: It is possible to affect the muscle size by as much as 47% with incorrect probe pressure. Bottom of the muscle must be visible on the image. Increase depth of scan if necessary. Research has shown that Muscle Thickness (Size) can be considered a surrogate for Muscle Mass/Volume, particularly in the lower limbs (Abe, et al., 2015., Abe, et al., 2016., Ogawa, et al., 2012). 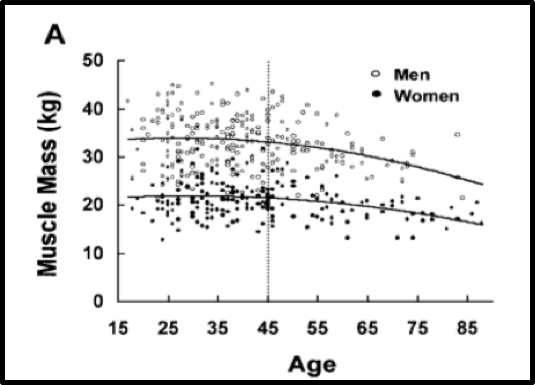 The two graphics in the left hand column below are taken from a study (Janssen, et al., 2000), published in the Journal of Applied Physiology that reports on skeletal muscle mass changes by age and gender. 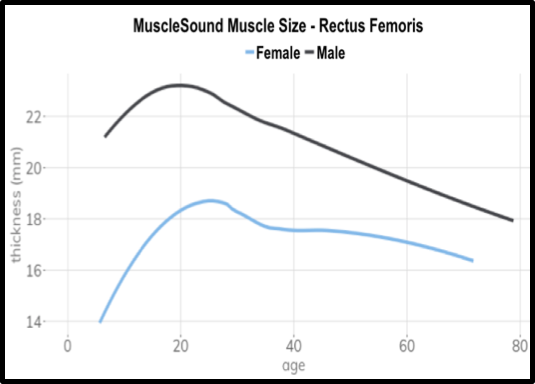 The two graphics in the right hand column below are taken from MuscleSound data on thigh muscle size collected over the last 4 years. 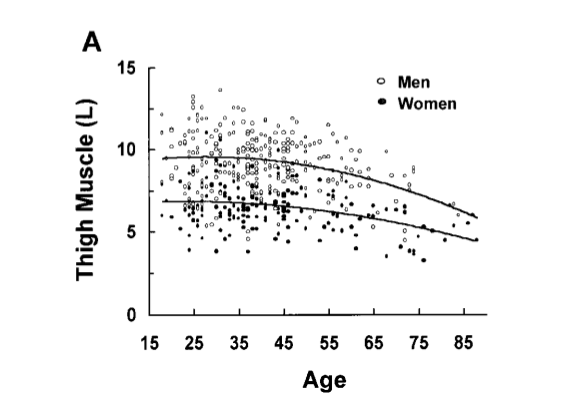 Age related loss of Total Muscle Mass closely patterns MuscleSound data on age related Muscle Size loss. Andersen & Saltin. Maximal perfusion of skeletal muscle in man. J Physiol 366: 233–249, 1985. Elsner & Carlson. Postexercise hyperemia in trained and untrained subjects. J Appl Physiol. 17:436-440, 1962. Garten, et al. The role of muscle mass in exercise-induced hyperemia. J Appl Physiol. 116: 1204–1209, 2014. Skeletal muscle mass and distribution in 468 men and women aged 18-88yr J Appl Physiol 89: 81–88, 2000. Krentz & Farthing. Neural and morphological changes in response to a 20-day intense eccentric training protocol. Eur J Appl Physiol. 110:333–340, 2010. Loenneke, et al. Time-course of muscle growth, and its relationship with muscle strength in both young and older women. Geriatr Gerontol Int. 1-8, 2017. Moritani & deVries. Neural factors verses hypertrophy in the time course of muscle strength gain. Am. J. Phys. Med. 58: 115-130, 1979. Sale, D. Neural adaptations to resistance training. Med. Sci Sports Exerc. 20: S135-S145, 1988. Sanada, K., et al. Prediction and validation of total and regional skeletal muscle mass by ultrasound in Japanese adults. Eur J Appl Physiol. 96: 24–31, 2006. Seynnes, et al. Early skeletal muscle hypertrophy and architectural changes in response to high-intensity resistance training. Appl. Physiol. 102: 368-373, 2007. Tillquist, M, et al. Bedside Ultrasound Is a Practical and Reliable Measurement Tool for Assessing Quadriceps Muscle Layer Thickness. J Parenter Enteral Nutr. 38:886-890, 2014. Wray et al., Onset exercise hyperaemia in humans: partitioning the contributors. J Physiol 565: 1053–1060, 2005.